This is an important week in Irish politics on both sides of the border. In the Republic, negotiators from Fine Gael and Fianna Fáil continue their intensive talks on forming a new government. A key leadership vote is tentatively set for 14 April, which is 48 days since the 26 February election. Ireland’s record for going without a government is 48 days, when a November 1992 election failed to produce a coalition pact until January 1993, according to the Associated Press. Now, if the two major parities and incoming small party and independent members fail to reach a deal soon, calls for a second election are likely to increase. That hasn’t happened since 1982. Stormont, the Northern Ireland Assembly building in Belfast. In Ulster, campaigning is heating up for the 5 May Northern Ireland Assembly election, with the first debate among leaders of the Democratic Unionist Party (DUP), Sinn Féin, Social Democratic and Labor Party (SDLP), Ulster Unionist Party (UUP) and the Alliance Party set for 13 April. 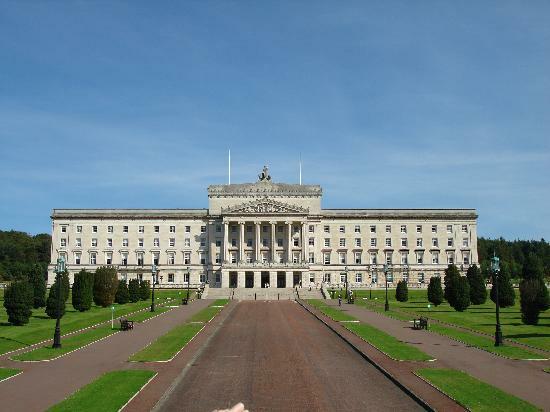 This is the fifth such election since the Good Friday Agreement of 1998 created the historic power-sharing legislature. Voters will cast ballots for 108 members from 18 constituencies in the six counties. In 1998, the (moderate) SDLP was the party with most votes in the Assembly, while the (moderate) UUP was the party with most seats. In the 2003 election, the (stronger pro-British) DUP took the most votes and seats, and (stronger Irish nationalist) Sinn Féin moved from being the fourth largest party, to the second largest party. In 2007 this trend consolidated, when the sum of votes for the DUP and SF reached 56%. By 2011, the DUP and SF were the undisputed largest parties in the system, leaving the SDLP, the UUP, and the Alliance significantly behind. The northern vote not only comes on the heels of the still-unresolved election outcome in the Republic, but also ahead of the 23 June referendum on whether the U.K. (including Northern Ireland) remains in the E.U. All of which puts the lie to notions that the U.S. is the only place having interesting elections this year. This entry was posted in Northern Ireland, Politics and tagged Democratic Unionist Party, Fianna Fail, Fine Gael, Good Friday Agreement, Sinn Féin, Social Democratic and Labor Party, Ulster Unionist Party on April 11, 2016 by admin.